UF Health’s Personalized Medicine Program has a new name — the Precision Medicine Program — and is ushering in a new era of genetic medicine, with the introduction of a new leadership team and preemptive pharmacogenetics testing. Beginning in 2019, the program will launch a multi-gene pharmacogenetics panel developed by UF Health Pathology Laboratories. It will examine multiple drugs, multiple genes and, eventually, diseases to personalize drug therapy and disease risk assessment around an individual’s genetic profile. Whereas pharmacogenetics testing at UF Health to date has largely been reactive — a physician orders the test in response to a certain health condition or drug therapy — the program aims to move toward preemptive testing, which will allow a broad panel of genotype data to be stored in a patient’s electronic health record, or EHR. The information will be accessible throughout a patient’s lifetime and inform future drug therapies based on genetics. In addition, alerts will be built into the EHR, allowing clinicians to target the most appropriate medical therapies to an individual patient. Preemptive pharmacogenetics testing is supported by UF and UF Health’s Platform for Life project, aimed at solving some of society’s most urgent problems. As part of a commitment to create the healthiest generation, UF Health is bridging basic discovery science with clinical and translational research — using precision health and data science to understand, treat and prevent disease and disparities. Rhonda Cooper-DeHoff, Pharm.D., M.S., is among the new leadership team and will serve as director of precision medicine in Gainesville. Spearheading the expanded translation of genomic medicine into clinical practice is a new leadership team at UF Health, led by Rasmussen as part of a Precision Health initiative being launched by the UF Clinical and Translational Science Institute, or CTSI. Supporting the efforts are more than a dozen precision medicine clinicians and researchers, led by three program directors in Gainesville and Jacksonville. Rhonda Cooper-DeHoff, Pharm.D., M.S., FAHA, FACC, an associate professor in the colleges of Pharmacy and Medicine, will be the director of precision medicine in Gainesville. Alex Parker, Ph.D., senior associate dean for research at the UF College of Medicine – Jacksonville, will serve as the director of precision medicine in Jacksonville. Thomas Pearson, M.D., Ph.D., M.H.A., a professor of epidemiology, will serve as the director of precision public health. David Nelson, M.D., interim senior vice president for health affairs and president of UF Health, and Julie Johnson, Pharm.D., dean and distinguished professor in the UF College of Pharmacy, co-founded the UF Health Personalized Medicine Program in 2011 as part of the UF CTSI and will move into advisory roles in the new leadership team. Michael-Clare-Salzler, M.D., a professor and chair of pathology in the UF College of Medicine, will round out the advisory team. Johnson and Nelson were instrumental in securing UF Health’s selection in 2013 as one of the first sites funded by the National Institutes of Health Implementing Genomics in Practice, or IGNITE, network. The six research sites selected were tasked with incorporating genomic information into EHRs and developing clinical decision support. In 2018, NIH renewed UF Health’s funding in the IGNITE II network, with a base award of $1.8 million over five years. Johnson will continue as the principal investigator on that grant. As the network defines its pragmatic clinical trials during the next year, UF Health expects to receive additional funding and play a prominent role in leading IGNITE II. For nearly a decade, UF Health’s Precision Medicine Program has been at the forefront of genomic medicine implementation nationally and contributed to a growing evidence base in support of genotype-guided therapy. 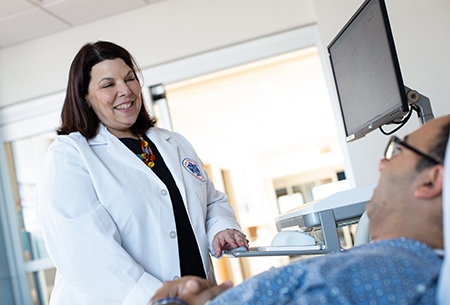 The program has addressed several patient safety initiatives at UF Health by improving patient outcomes through better-informed medication prescribing and reducing adverse drug effects. More than 4,600 clinical pharmacogenomics tests have been ordered at UF Health hospitals in Gainesville and Jacksonville.